Moune (pronounced “moon”) is a 21-year-old French artist who produces electronic and instrumental dub. He started to play the guitar in 2008 and discovered electronic music in 2014. After many experiments with very different styles like hip-hop, house, trance, glitch hop and electro swing, he finally started to create dubwize music in 2017. Being a multi-instrumentalist, Moune plays guitar, melodica, saxophone, flute and percussions. He also uses his voice in some of his compositions, sending out his conscious message. He loves to mix the dubwize/electronic sounds with acoustic instruments and ethnic melodies, which results in the creation of very melodic and energetic dubwise music ... and all this produced in his bedroom studio! 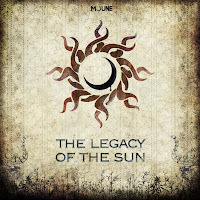 The Legacy Of The Sun is the first release of Moune on the label. It includes altogether five tracks; two with vocals by Moune himself and three instrumentals, all with a heavy ethnic dubwise feeling. All five tracks of the EP are composed, mixed and performed by Moune himself. The best way to describe the style of this young French artist is not with words. You have to listen to it yourself and we are sure you will enjoy his musical adventure.